Human beings and other animals serve as hosts or as sustenance for a diverse array of biting and infesting arthropods. We urge those who believe they’ve been so burdened to first review our resource What’s biting me? Among those creatures that bite or infest people are several kinds of mites that burrow into and infest the skin, and yet more kinds that anchor themselves onto the skin for minutes to days while they feed on blood and other tissue fluids. Whereas such bites and infestations may cause considerable annoyance and discomfort, some mites transmit microbes that result in serious infections, disease and even death. We’ve drafted this resource to offer a glimpse of several of the most frequently encountered mites. If you have questions that you do not see addressed here, please feel free to contact us. We will strive to answer any specific question you may have concerning mites and may add that information to this resource. How do I know if I am infested or bitten by mites? How do I find, sample & submit mites for evaluation? 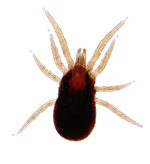 We provide these FAQs to provide parents, health workers, school officials and others with important information relevant to the biology, diagnosis and management of infestations associated with mites. Brand names have not been mentioned, nor do we endorse any particular commercial product. This web site is intended for informational purposes and is not meant to substitute for the advice provided by a medical professional. Always consult a physician if you have personal health concerns.